The coffee plants belong to the botanic class of the Rubiaceae which are represented by cleaver and woodruff in our zone. About 500 categories with more than 6000 types belong to this plant family. Basically there are only two kinds used for the processing to coffee: Arabian coffee (Coffea arabica) and Robusta (Coffea canephora). The Arabica coffee got its name from the Arabians which brought it from East-Africa to Arabia in the 15th century. The two main types differ also physically. The Arabica bean is a bit longer than the Robusta bean and has a rolling cut in the middle of the bean. The Robusta bean in contrast, has a straighter cut and a more roundish form. Moreover, it is more resistant against heat, maladies and parasites. The time of ripeness of the Robusta bean lasts 6-8 months, the one of the Arabica bean 9-11 months. The coffee shrub can be up to 10 metres high. Wildly growing shrubs can be up to 15 metres high. However, the coffee shrubs on the plantations are maintained at a height of 2 to 3 metres to make the harvest of the plant easier. Botanically seen, the plants are a rarity, as they bloom and yield fruit at the same time. During the time of ripeness the colour of its fruit changes from green to yellow to red. Some cultivars bear fruits which are yellow in the end of their process of ripeness. 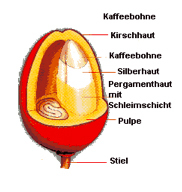 The fruits that look like cherries shelter the coffee bean in its interior. They are the seeds of the coffee plant. A thin outer layer (exocarp) encloses the middle layer (mesocarp) followed by a layer containing mucilage and the inner layer (endocarp), which can also be called bean legume. There are normally two beans in it, enclosed by a silver membrane. The amount of ingredients differs from coffee to coffee and varies according to the various cultivation areas, preparation and age of coffee. Whereas the beans of the Arabica coffee for example only contain 0,9-1,4% caffeine, the Robusta coffee contains at least double the amount of caffeine. Through preparation the caffeine content changes. In white coffee or cappuccino the caffeine content is a little lower than in black filtered coffee, because caffeine only completely dissolves in water and not in milk.